I wracked my brain trying to come up with something clever for this year's recipe. Did I want to do something sweet? Perhaps something savory? How best to showcase my love for the Italian chocolate-hazelnut spread? At a loss, I resigned myself to sitting this year out. So I busied myself making my basic lemon, salt and pepper baked chicken. Then as I stripped the leftover chicken from the bones, I figured I'd save some of the shredded chicken for enchiladas. 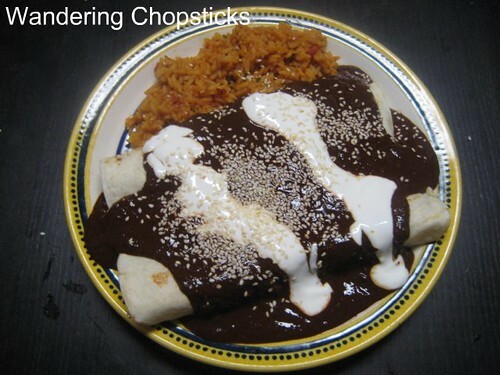 Instead of ordinary enchiladas, how 'bout I try my hand at making Mexican mole? And instead of mole with Mexican chocolate, I could use Nutella! I decided to make mole poblano since that's the version I've eaten the most. 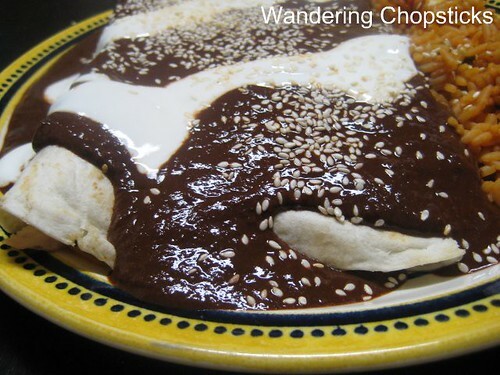 According to Wikipedia, mole poblano comes from the Mexican state of Puebla and is made with chili peppers, ground nuts, spices, chocolate, salt, onions, and garlic. A little Googling turned up David Lebovitz's Chocolate Mole Recipe, which was comprised of ingredients I already had in my pantry. A little tweaking here and there, and surprisingly, except for being a little sweeter than some moles I've eaten, the smooth hazelnut-chocolate taste of Nutella blended in quite nicely with the almonds, chili peppers, and spices in the sauce. 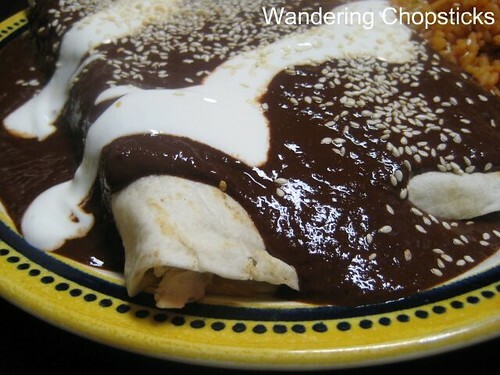 Adapted from David Lebovitz's Chocolate Mole Recipe and MuyBueno.net mole mancha manteles. Typically, you'd poach the chicken and use the broth for the mole, but I prefer the taste of baked chicken. So make my baked chicken recipe, then shred any leftover meat from the bones. Boil the bones to make broth. Set aside the chicken and broth. Remove stems and seeds from dried chili peppers. Soak in warm water. Set aside. In a saucepan, saute 1/2 chopped onion and 3 cloves chopped garlic until just softened. Also add 1/4 cup almonds, 1/2 tsp salt, 1/2 tsp cinnamon, 1/2 tsp oregano, 1/4 tsp black pepper, 1/4 tsp cloves, and 1/4 tsp cumin. Drain and squeeze out water from the chili peppers. Add the chili peppers, the mixture from the sauce pan, and 1/2 of the can of tomato sauce in the food processor. Add more of the tomato sauce if needed to blend the mixture more smoothly. Add the mixture back into the saucepan with the rest of the tomato sauce. Add 1/4 cup Nutella and 1/2-oz or half a bar of unsweetened dark chocolate. On medium-low heat, add about 1/2 cup chicken broth and stir until the mixture is well-blended. You might need another 1/2 cup of chicken broth. You don't want the mole to be too thick, nor to thin. Some recipes suggest using bread or crackers to thicken the sauce, but I didn't feel the need for it. Taste. Adjust if necessary. Add more Nutella or dark chocolate if you want a dark, dark mole. When the sauce is ready, turn the heat down to the lowest setting. In another pan, add a few drizzles of oil and lightly pan-fry the tortillas just so they become pliable. I used very little oil. Just enough so the tortillas don't stick, but not enough to make them oily. Then roll up the enchiladas with the shredded chicken and some Mexican four-cheese blend if you wish. I lightly pan-fried them again so the cheese could melt. Lay the enchiladas on a plate and liberally pour the mole poblano on top. Thin out about 2 tblsp of sour cream with 1 to 2 tsp milk. Drizzle the cream on top. Sprinkle sesame seeds over everything. I'm submitting this recipe to World Nutella Day hosted by Sara from Ms. Adventures in Italy and Michelle from Bleeding Espresso. Check back with them on February 9 for a round-up of Nutella recipes from around the world. 1 year ago today, German Oven Pancakes. 2 years ago today, Pupusas with Beans and Cheese. World Nutella Day! I wish I knew. I would have eaten some directly from the jar!! Hi WC - I love the colors and contrasts. Nice job of improvisation. Believe it or not, I've never tried Nutella before. Always have wondered if it was good or not. Vegemite yes, Nutella, no. Nutella mole is just brilliant. Looks decadently delicious. Nutella mole--how unique! It looks great on the plate and I bet it is delicious. I should never come to your blog when I am starving! Now my lowly bowl of leftover soup simply will not satify! Holy "mole"! What an inspired idea! Not only does this dish sound fabulous, it looks amazing too! I found your blog via Blazing Hot Wok. Whoa ... 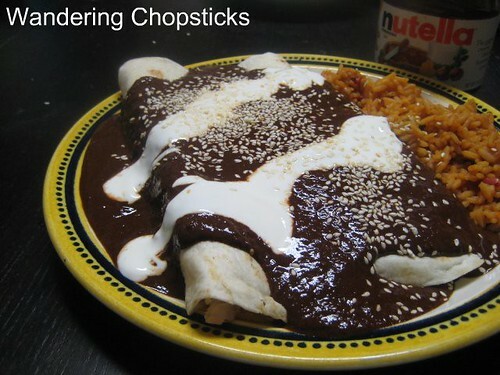 I'd love a serving of your Nutella Mole Chix Enchilada's! I like how you lightly pan fried your filled enchilada before saucing them. YUM! One comment, many moles, specially the Poblanos are more on the sweeter side, my mom cooks the best mole I've ever ate, and she learn it from her mom, a Oaxaca style mole, which is not as sweet as the poblano mole, but since my mom (and I) have a sweet tooth what she does is she sprinkle some sugar over her mole right before dive on it!! I made some chicken enchiladas recently. Your Nutella mole sounds amazing! I'm bookmarking this!! I often eat directly from the jar myself. Don't worry, there's always next year. Thanks! The color is just black, black, black. That's because I invented it. :) Funny. I've never eaten Nutella at restaurants or cafes, I've only eaten it at home. Ewww. Vegemite is nasty. It's not even a comparison. Nutella all the way. Whenever I visit your blog, I feel like I should be doing ten things as once. Thanks. It's nothing compared to yours. Those aebleskivers are awesome. The pan-frying helps to soften the tortilla to make it easier to roll. I know! I can't believe you didn't think of it first. That's great to know that mole poblanos are on the sweeter side. That makes the Nutella even more appropriate. I hope you try my recipe. Nutella actually works quite well. Nutella mole? You are some sort of genius! I don't think I have ever seen Nutella used in such a savory way and I love this idea! So creative. Genius way to use the nutella! For me, I have only used it 2 ways: on ice cream as well as bread. This is very, very cool. The smoothness and thickness from the nutella looks like it has made the mole thick! Certainly is interesting how chocolate can make even savoury dishes taste good. very neat savory way to use nutella. it must make the mole creamy and lovely. For world nutella day I had a cheese plate and nutella on the side - was pretty good. Wow, this looks so incredible. I can't believe how delicious it looks! I think I'll try this out the next time I make enchiladas...thanks for the recipe! It looks great! Thanks for sharing all these delicious recipes with us! BTW, you are tagged! Please see my blog for details. Nutella in mole sauce! Absolutely brilliant! I wonder if I'm the only person who's come up with that combo? I've never used Nutella on ice cream before. Do you melt it like fudge? The mole was quite creamy. Cheese plate and Nutella on the side sounds great too. I hope you do. It's a great variation from the usual enchiladas. There's always next year. And Nutella really doesn't need anything except to spread it on bread. Yay! I love comments on old recipes. Especially when it's a compliment. :) That's the great thing with moles, you can adjust a bit here and there. Chocolate in mole poblano, wasn't much of a reach to think of Nutella. This sounds good.....am going to try it. But I prefer corn tortillas....eat them everyday with refried beans, well, they're not really fried, just smashed with a spatula, heated, add fresh tomato salsa (from a jar)and top with monterey cheddar cheese. Really good. Corn tortillas work great too. Your refried beans sound a lot healthier than the usual preparation. Curious, why seed the peppers? To make a smoother paste. But, you can certainly leave the seeds in if you want it spicy.